Fresh cassava is one of those things I missed living in England. When I was staying in the far east years ago, we always had cassava growing at the back garden. It's so easy to grow and one plant usually yields around 10kg of starchy roots. We had them steamed and eaten dipped in sugar, curry, cassava crisps/chips and my favourite cassava cake. There are various names for cassava. In Malay it is ubi kayu meaning wood potato. In Chinese also wood potato or 'muk shu'. 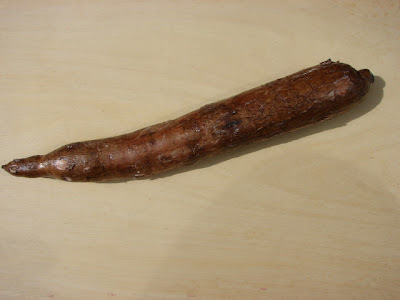 Other names include singkong (Indonesian), stick yam, yuca or yucca, monioc etc.... There are white flesh and yellow flesh cassava. Last week I saw fresh cassava at a Turkish grocery store, so happy I bought some hoping to make some cassava cake. This cassava as per picture above looked perfect on the outside but unfortunately after peeling nearly 1/2 had gone bad. So disappointed, don't think I will buy fresh cassava again. I ended up buying some frozen cassava from Tesco to top up for this recipe. 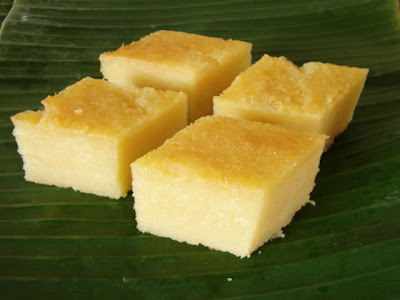 Bingka ubi kayu is a traditional Malay kuih, soft and chewy and rich in coconut. I like to make it golden by adding custard powder. I think there are similar Vietnamese and Filipino style cassava cakes. Vietnamese called theirs 'banh khoai mi Nuong'. Filipino cassava cake is 'cassava bibingka'. If using fresh cassava, peel and clean the cassava. If using frozen defrost before use. Make sure to remove the wooden stem at the centre of the starchy root. Then cut the cassava into small pieces. Use a food processor, blend half of the cassava with 1 egg and half tin of coconut milk to a smooth puree. Pour the mixture into a large mixing bowl. Then process the other half cassava with another egg and the remaining coconut milk. Adding egg and coconut milk just help the machine to run smoother. You can just grate or blend the cassava on its own. Mix in the last egg, sugar, butter, custard powder and tapioca starch. Grease the tin/dish with butter. Pour in the mixture. Bake at 165 - 170deg C for about 1 hour or till cooked through. Can be eaten when piping hot as pudding or cut into slices when cooled. When hot it is much softer. Any leftover can keep in the fridge for few days, just reheat in the microwave for about 1 minute to refresh. Note: if you don't want to make a big slab of cake like above, reduce qty as required. Use any tin or dish you like (except loose bottom) including individual dish like ramekin and adjust cooking time. If using Tesco frozen cassava it's 750g a pack, use 1 pack for a smaller qty and 2/3 the rest of the ingredients and use a 20cm square x 5 cm tall tin. If you have any leftover cake batter, try making some small pancakes, it's lovely. Love this! I never knew they sell cassava in Tesco/Asda! Will have a look out for it next time. This is my favourite kuih! Love it! Unfortunately, the first (and last) time I made it, the insides sank and the whole cake was strangely hollow. The flavour was good though. Thanks for the tip on Tesco's cassava! Your cake hollowed out and sunk in the middle, it's likely the mix was too liquid or too much eggs. The cake risen during baking and sunk after leaving the oven. Try this recipe should be ok. The cake shouldn't rise much at all.